Did you register to vote yet? Are you even eligible to vote? All important questions — especially if you’re not sure. But you’re in luck — we’ll show you how to find out. Tuesday is National Voter Registration Day, a nonpartisan effort with a goal of registering 300,000 people nationwide. The deadline to register to vote in the Nov. 6 midterm election is Oct. 6. The short answer: All U.S. citizens, who will be at least 18 by Election Day are eligible to register to vote. But there are a few exceptions. Not determined by a final judgment of a court exercising probate jurisdiction to be (1) totally mentally incapacitated; or (2) partially mentally incapacitated without the right to vote. 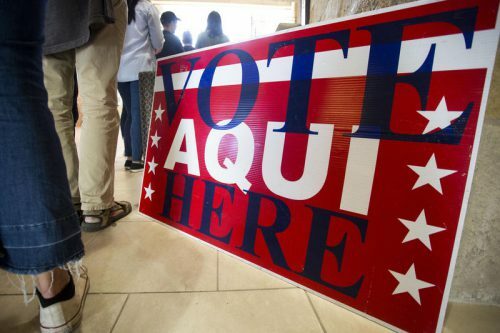 If you’re not sure if you are registered to vote, visit the state’s online database. Additional information is available on the Texas Secretary of State’s votetexas.gov site. Online registration is currently not an option. But, you can mail in your registration after filling out this form and send it to your local election office. You can also register to vote in person. Find your local election office for more information. This entry was posted in KRTS News and tagged TXDecides. Bookmark the permalink.